Society in Mesopotamia was strictly hierarchically organized. Artificial irrigation was the only way to produce enough food but it required better organization than in Egypt where the annual Nile flooding was controlled by small and economically independent communities. Heat in Mesopotamia was severer than in Egypt, while the Tigris had much deeper stream than the Nile making construction of the channels much more difficult and complicated. Very difficult was also to predict the floods because they depended from snow melting in Anatolia and could occur at the time of ripening crops in March or April which means that the floodwater had to be held up. Besides unfavorable flooding time the floodwater returned to the river stream just before the summer heat in June. For that reason the fields had to be artificially irrigated all the time. However, because of perpetual irrigation the farmers in Mesopotamia harvested twice a year, while the Egyptians harvested only once. The irrigation systems which were essential for agriculture required great amount of physically hard work, complicated construction and the most important of all mobilization of sufficient labour force and good organization. Thus artificial irrigation eventually led to formation of larger communities and social stratification into three classes: nobility, free citizens and slaves. Nobility, priesthood and a priest-king as supreme religious and secular ruler were responsible for the construction, organization and maintenance of irrigation systems. Priest-kings called en, lugal or ensi were viewed as representatives of city’s patron god whom belonged all the land of the city. Priest-kings lived in the temples which were both religious and administrative centers of particular irrigation system unit. Around the temples developed cities as administrative, religious and trade centers resulting in the emergence of Sumerian city-states also referred as the temple-states because of the leading role of priesthood in society. The Sumerian cities were inhabited by nobility executing king’s will and orders through a well organized administrative apparatus. The Sumerian priest-kings collected taxes usually in goods to sustain the governmental and administrative organization, while the Sumerian priest invented writing - the Cuneiform script to simplify state administration and trading. Besides priesthood and nobility, Sumerian city population consisted of merchants, craftsmen and others who were mostly engaged in trade. The middle class of merchants and craftsmen in Mesopotamia was very strong and relatively independent. Merchants and craftsmen in Mesopotamia were allowed to take initiative and did not only work on king’s order like the Egyptian merchants and craftsmen. Farmers, shepherds, fishermen and hunters in Mesopotamia lived in the city surroundings and were the lower class of the Mesopotamian society. They took care for food supply of the cities and were mostly poor but personally free. At the very bottom of social hierarchy in Mesopotamia were the slaves who were mostly prisoners of war. Slaves could be bought or sold but they were allowed to marry and to have families. Special position in both administration and economy had the scribes. 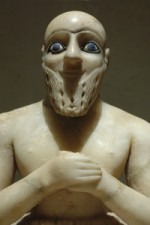 The priest-kings were replaced by monarchical rule during the Akkadian Period (c. 2340 BC - 2150 BC) which probably resulted in greater social stratification. Unlike during Old Sumerian Period when all land was owned by the temples the sources from Akkadian Period mention private possession. The Old Sumerian social order with strong middle class was mostly restored after the fall of Akkadian Empire but society in Mesopotamia became mostly feudal about middle of the 2nd millennium BC (Middle Babylonian Period). Noble families held land as inalienable fiefs, while the farmers were becoming more dependent.